Hello! My friends and I really enjoyed breaking out our Christmas designs throughout last year so we are back to do it again this year. 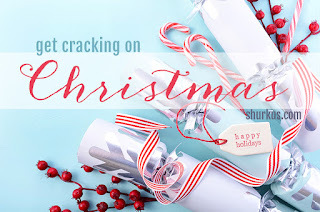 The idea behind Get Cracking on Christmas sprung from the fact that many of us crafters who work in the industry with stamp companies seem to be busy with other things come the holiday season that we never seem to have time to make holiday projects. So once a month we are making a holiday card so by the end of the year we are guaranteed to have a handful of holiday cards ready for the season. 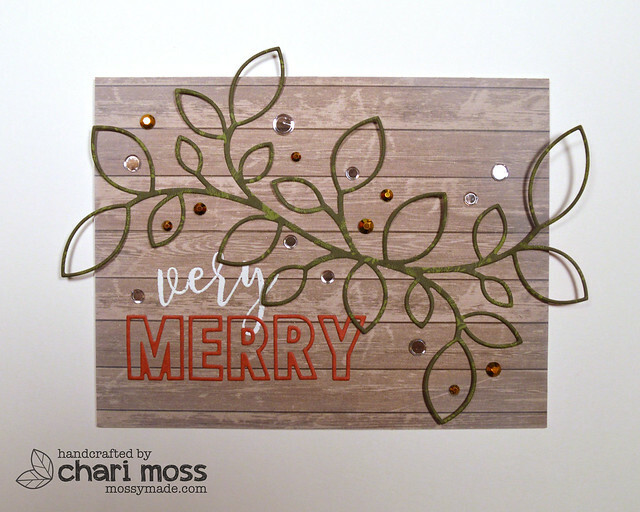 I am joined by my friends Jenn, Cheiron, Libby, and Caryn today sharing a batch of Christmas projects. Today's card takes a break from the cuteness that typically lives here and uses some die cuts and Christmas paper pad that have been sitting in my craft room waiting to be used. Covered the card base with a weathered wood pattern paper. Then I used the Concord & 9th Sophisticated Script stamps to white emboss the first half of my sentiment. The die cut pieces of my sentiment are also from Concord & 9th. I used the Double-Cut Alphabet dies to cut a red pattern paper. I thought the outline letters would go well with the outline cluster leaves die cut from Simon Says Stamp, cut from green pattern paper. I finished off the card with some Studio Katia gold crystals and majestic confetti embellishments. Not a super traditional Christmas card but I love how it turned out. Be sure and visit Jenn, Cheiron, Libby, and Caryn for more Get Cracking on Christmas projects and if you want to join us on our monthly quest to make holiday projects please share on social media using #getcrackingonchristmas. Hello! 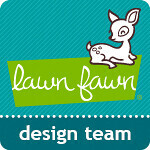 Today is the last day of Lawn Fawn release week and all the new products will be available tomorrow! 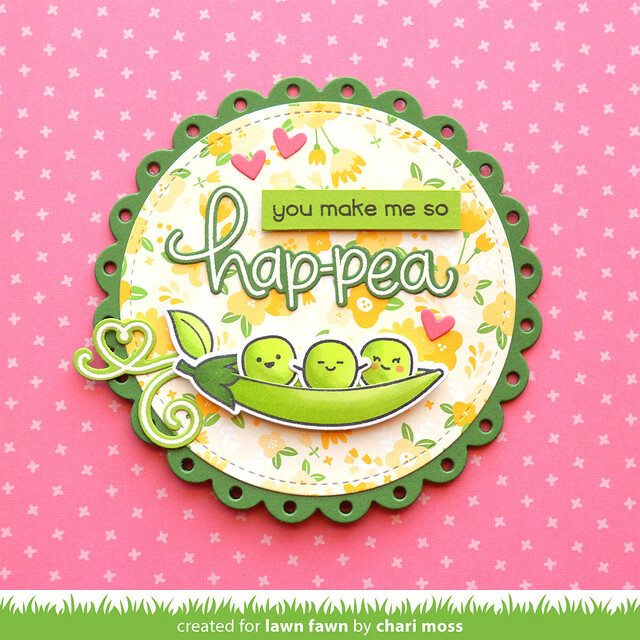 Today we are featuring the new set Be Hap-pea which is filled with some super cute little peas. Who knew veggies could be so cute! I love that you can put as many peas as you like in the pod and that there is a die that cuts the slit so they fit inside. 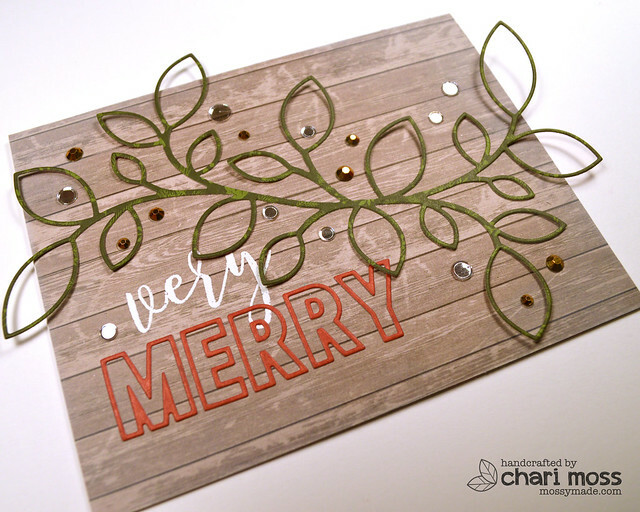 I created this circle card with the fancy scalloped circle dies. I picked the yellow flower paper from Spring Fling because of the pops of green in the design. 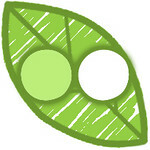 I thought it went perfectly with the green of my pea pod. 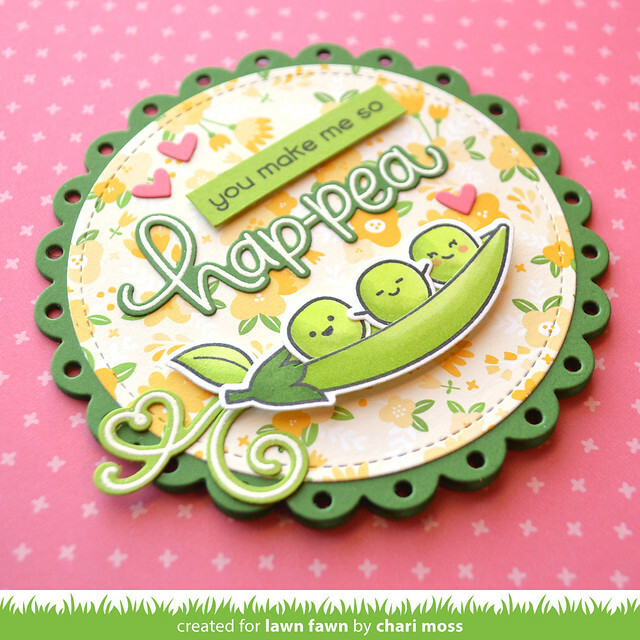 I also love that there is a die to cut out the scripty sentiment "Hap-pea" in the stamp set. I think this just adds some fun detail to your projects. 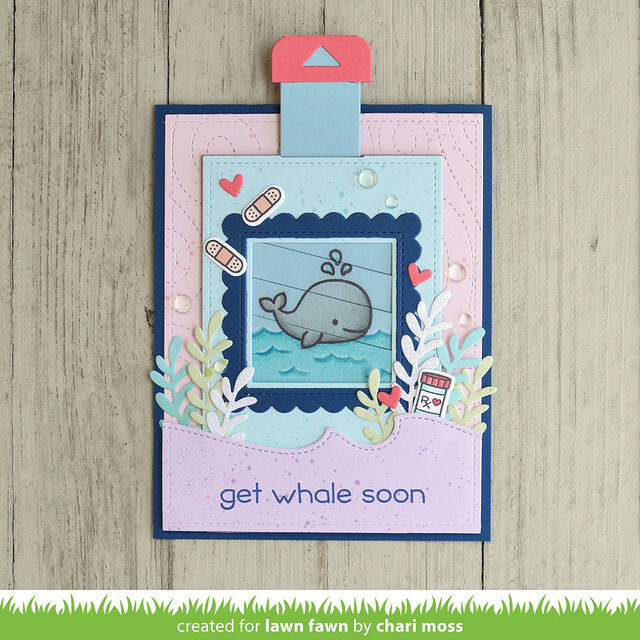 Be sure to check out the Lawn Fawn blog and the Be Hap-pea intro video for more projects including today's card! Hello! 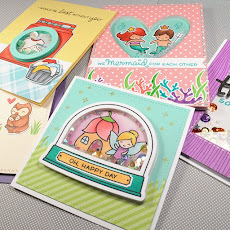 Today for Lawn Fawn Release week I have two cards featuring the new Reveal Wheel Spring Sentiments. The first card I made was inspired by Megan. I did change it up a little bit to make it more springy. 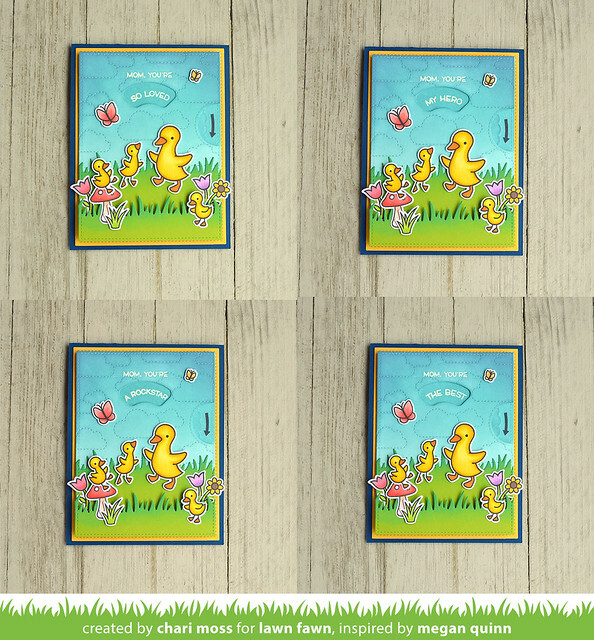 really loved the little mama duck with the babies to coordinate with the mom sentiments in this set. I cut the stitched cloud backdrop and added distress oxide inks to the sky in tumbled glass, broken china and faded jeans. For the grass blended some lucky clover ink to the top of the grass cut from cilantro cardstock. 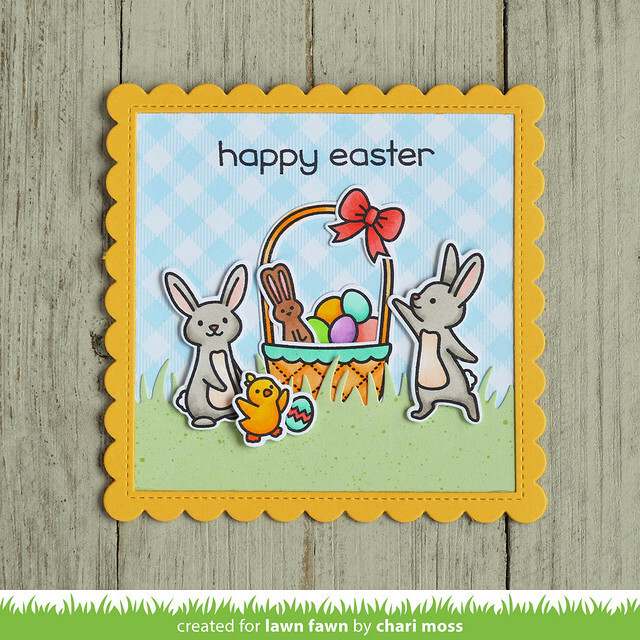 My second card features the baby sentiment in the Reveal Wheel Spring Sentiments set. 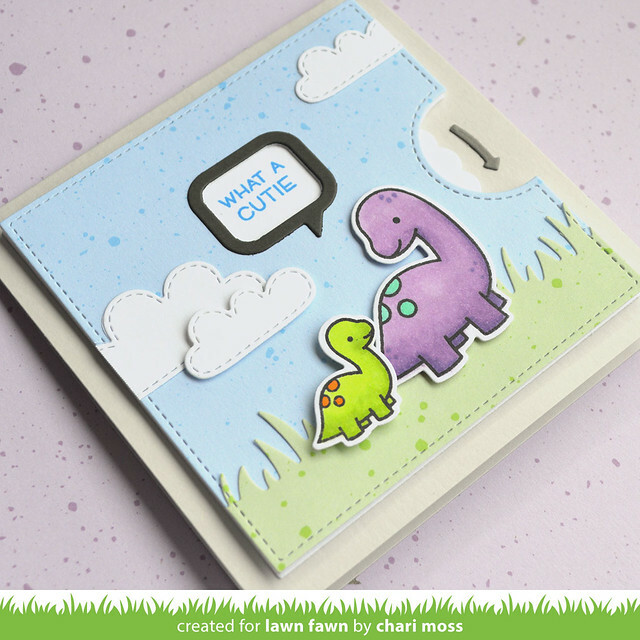 I used some dinos from RAWRSOME and Spiffy Speckles paper to create a simple baby card. 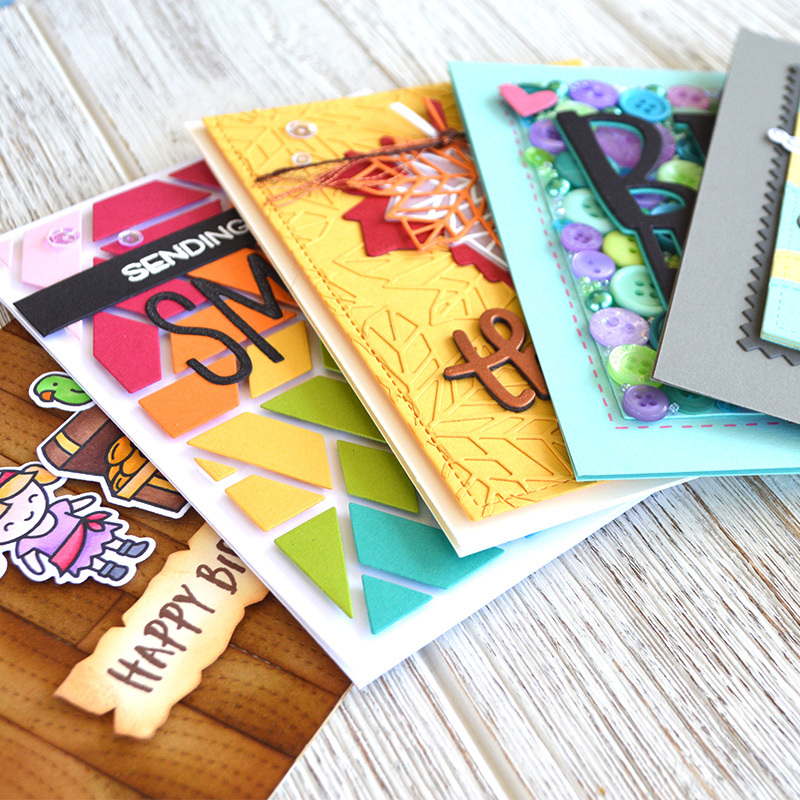 I used the new reveal wheel templates for both cards which make it very easy to stamp and line up the sentiments in the reveal wheel openings. 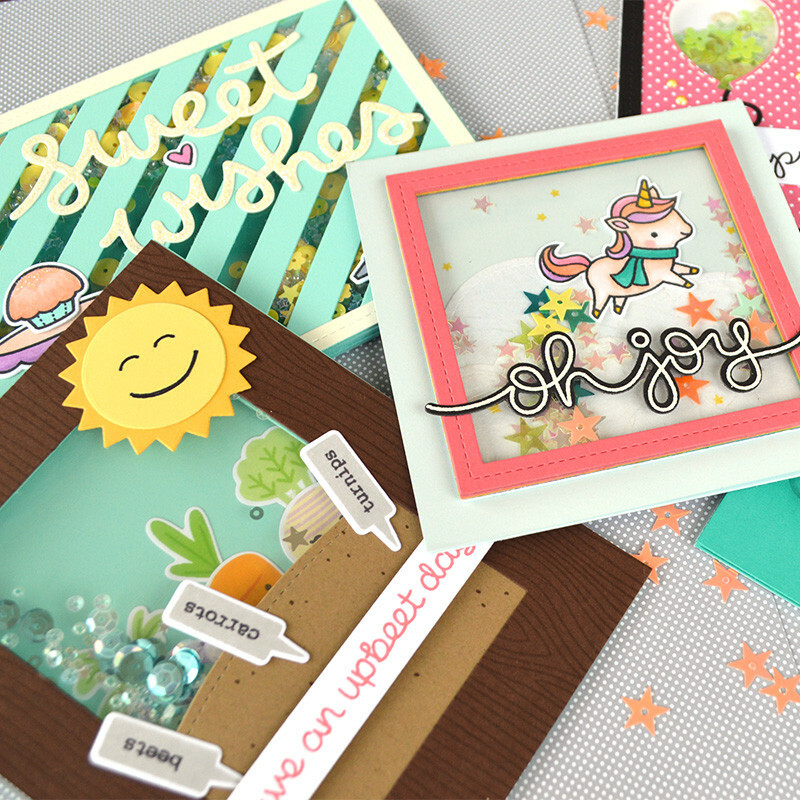 I love the soft colors of the Spiffy Speckles paper and think it really makes for a sweet baby card. 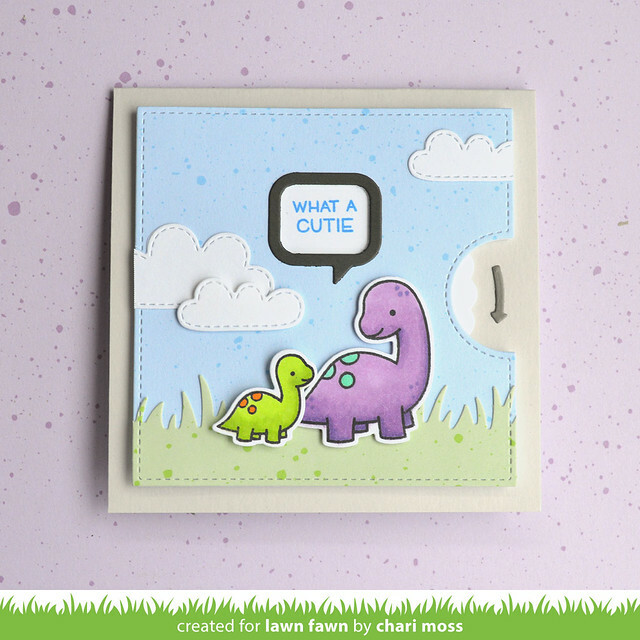 Be sure to check out the Lawn Fawn Blog for the intro video showing just how I created these two cards. 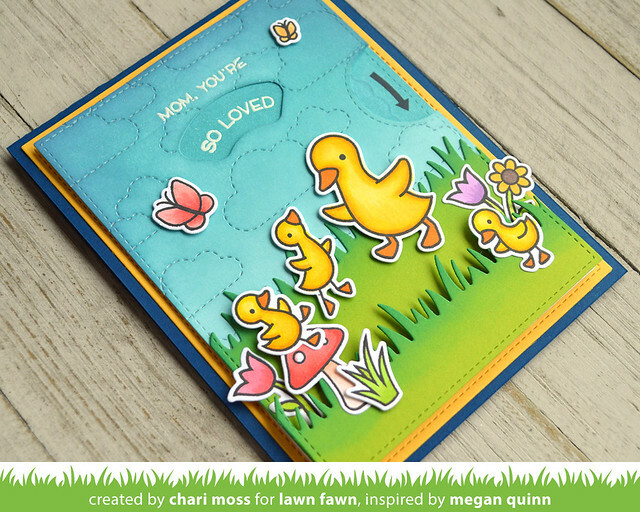 You can check out the rest of the Design Team's projects including Megan's duck card that inspired mine. Hello! 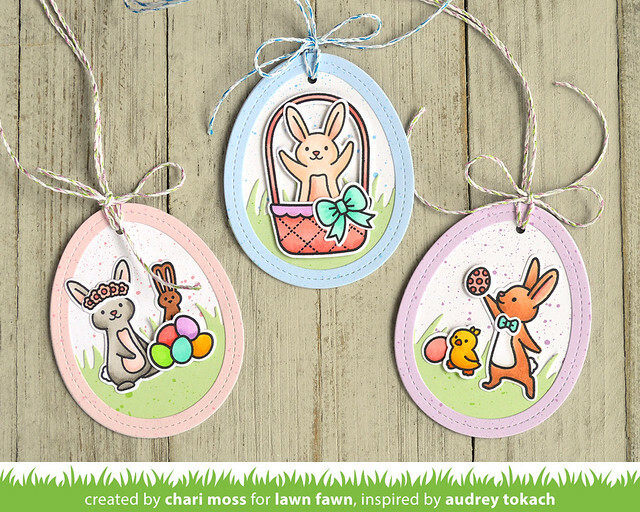 Today for Lawn Fawn Release week we are featuring the new set Eggstra Special Easter. I was really pleased with this little easter card. I love the gingham as the sky and I think it pairs perfectly with these easter bunnies and basket. I used a scalloped stitched square frame cut from sunflower cardstock to frame the scene and some spiffy speckles for the grass. 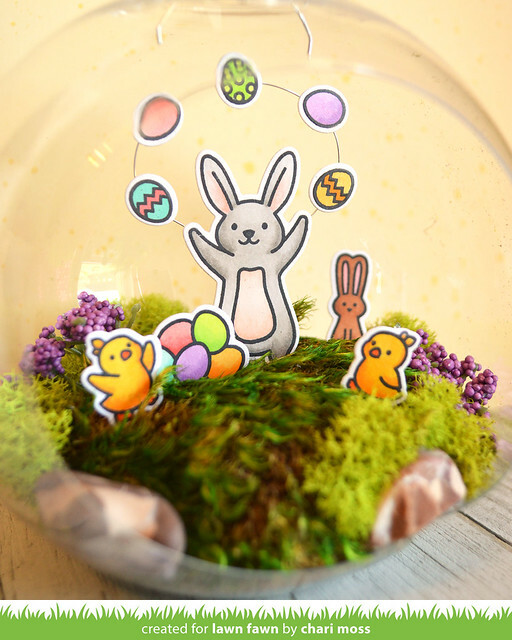 I also created a little ornament scene with the bunny juggling the easter eggs. I used a wire to attach the eggs so that it looks like he is juggling them in the air and I love how the whole little scene turned out. 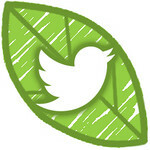 I also create some egg shaped tags inspired by me fellow design team member Audrey. 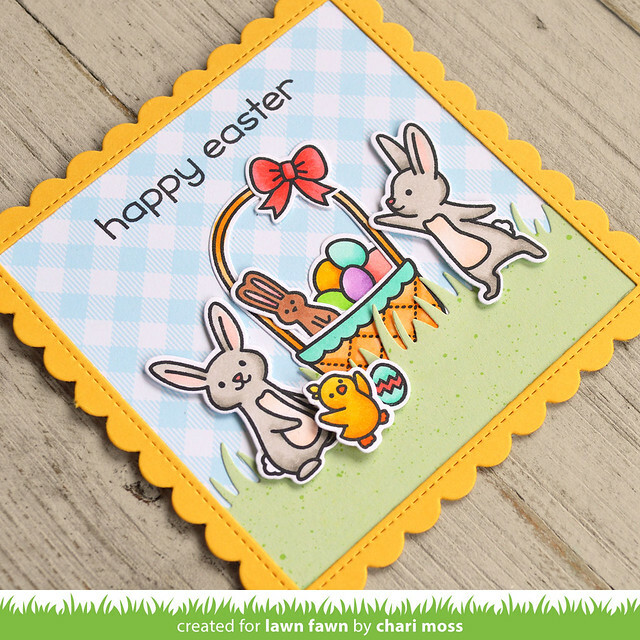 You can check these out as part of the Eggstra Special Easter intro video as well as my first card. 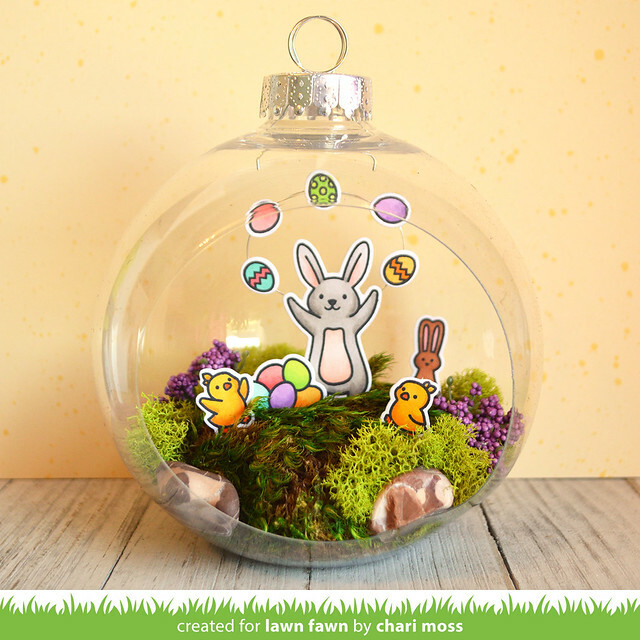 Be sure to stop by the Lawn Fawn Blog for more Eggstra Special Easter projects. Hello! Happy Saturday. 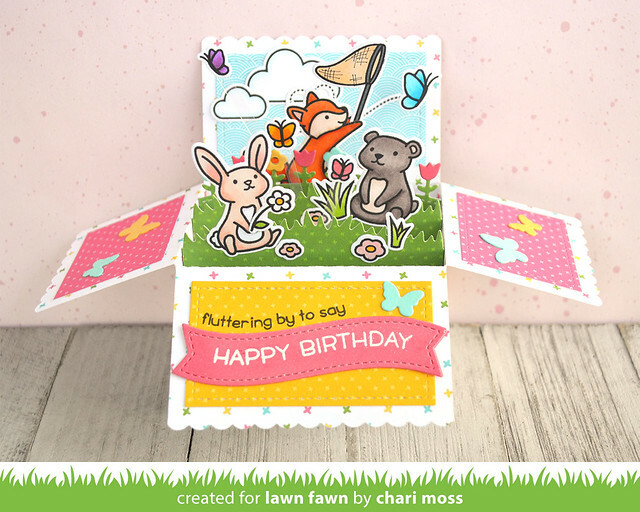 Today we are continuting Lawn Fawn Release week with the new set Butterfly Kisses. 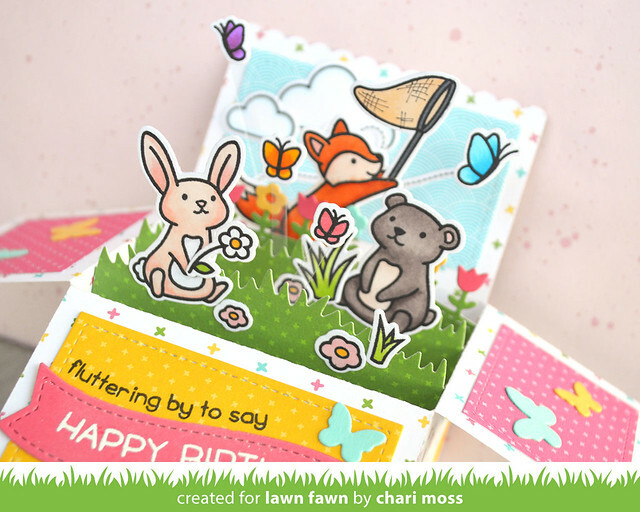 This new set has some super cute new critters to add to the Lawn Fawn family and lots of buterflies of course. First up I have a Scalloped Box Card Pop-up design. I used lots of Spring Fling papers to create this box and I used the inserts from the new Park and Spring Add-on sets for the Shadow Box card to create the grassy hills and flowers. All the Shadow Box inserts fit in the pop-up box because they are the same size. I added my butterflies with some strips of clear acetate so they look as if they are flying. 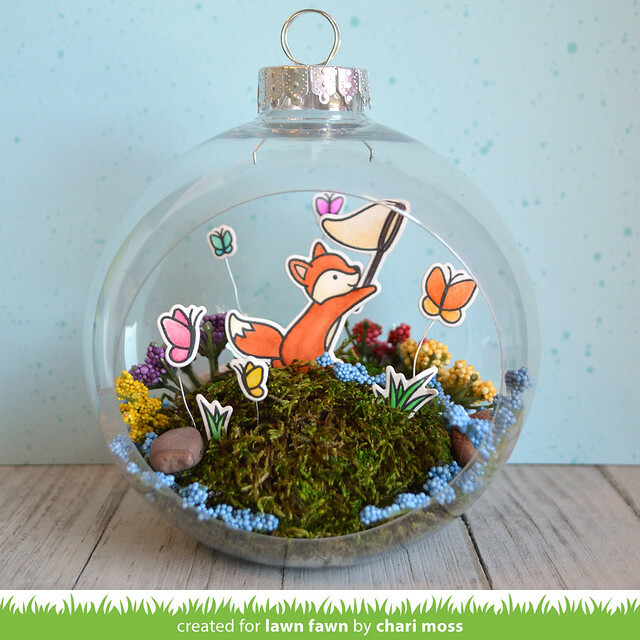 I also created a little terrarium inside of a large plastic Christmas ornament I purchased at Michaels during the holiday season. I cut a styro foam ball in half and hot glued into the bottom of the globe then covered with moss and artificial flower pieces and rocks. The stamped image is glued to a toothpick inserted into the foam below and the butterflies are on thin pieces of wire. 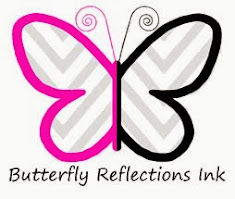 Be sure to check out the Lawn Fawn blog to see more Butterfly Kisses projects as well as the intro video where you can see just how my pop-up box came together. Hello! Lawn Fawn release week continues today with the new Magic Picture Changer die. I created a card using colored pencils on colored cardstock for my images. 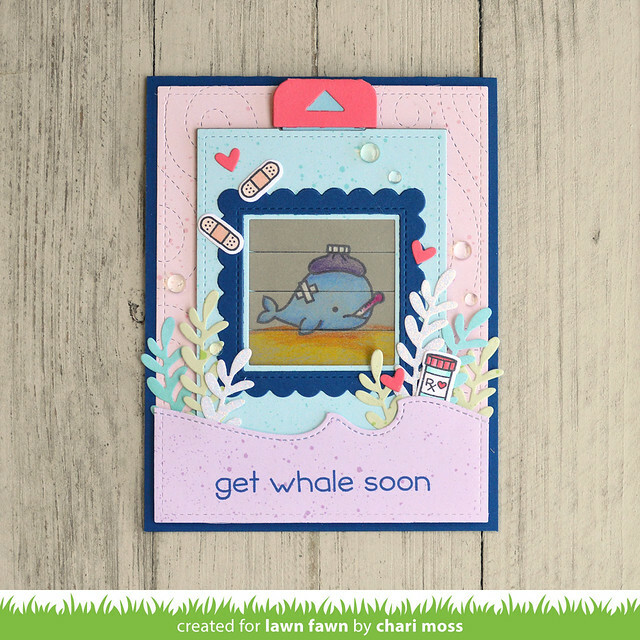 I used the windy backdrop die for my background and I also added the scalloped square stitched frame around the window opening. 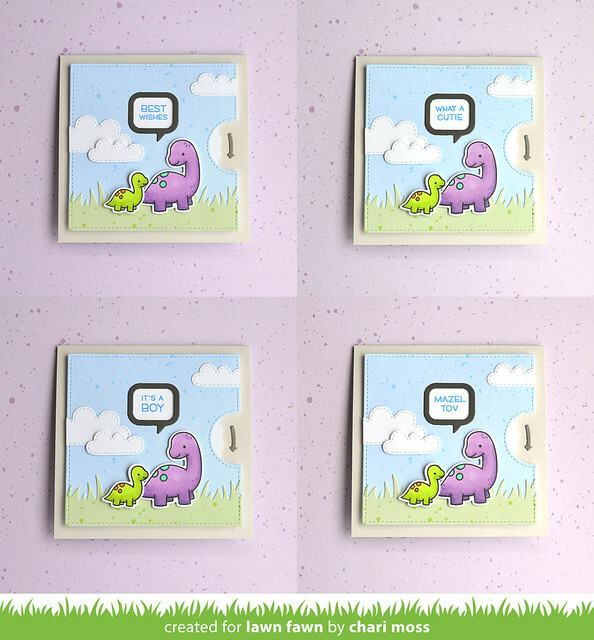 I also used the Magic Picture Changer Add-on die to finish off the front with some pattern paper. The wave along the bottom created a perfect place for the sentiment. I also added some seaweed (cut with the large wreath die) and some other small images and embellishments around the changing picture as well. Check out the video tutorial below or HERE on my YouTube channel to see just how I created this card. Be sure to check out the Lawn Fawn blog for more Magic Picture Changer idea as well as the intro video showing just how this innovative die works. It's much easier than you think! 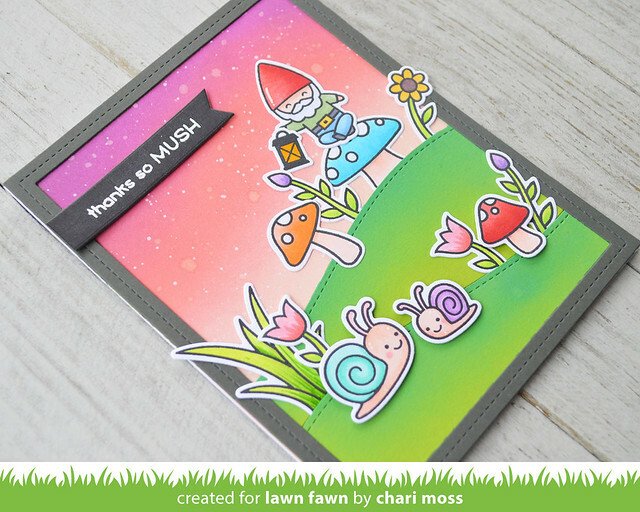 Lawn Fawn February Inspiration + Release Week: Oh Gnome! Hello! Welcome to Lawn Fawn Release week! 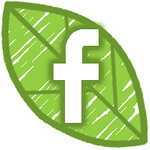 This week we are featuring some of the new products that will be available on February 21st. Today we are starting out with Oh Gnome! 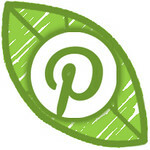 :) I have a card as well as a little terrarium ornament to share. For this card, I blended a twilight sky with distress oxide ink in seedless preserves, abandoned coral and tattered rose. I added some water splatters and white watercolor paint splatters to the sky. I think it looks adds to the twilight look and could be stars coming out or fireflies. I cut the hillside backdrop from cilantro cardstock and inked the top edges with lucky clover distress oxide ink. The sentiment is white embossed on a black banner and I added a storm cloud frame to the whole thing to finish it off. 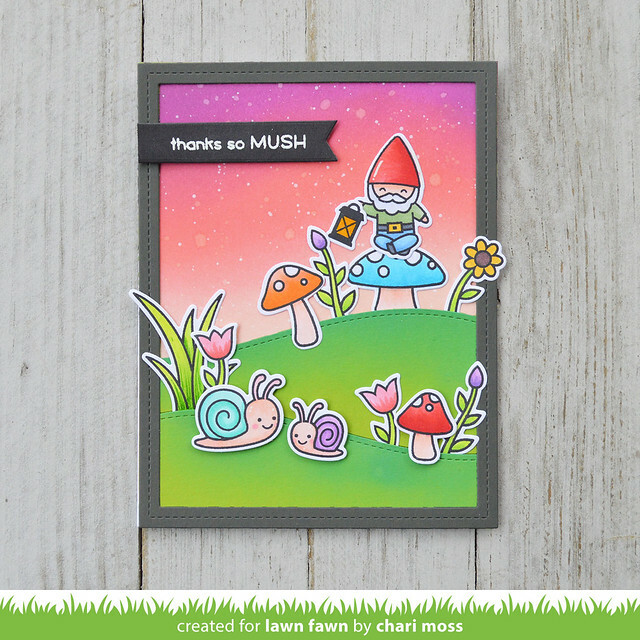 You can see just how I created this card as part of the Oh Gnome! 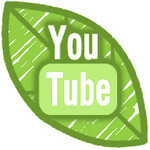 Intro video. 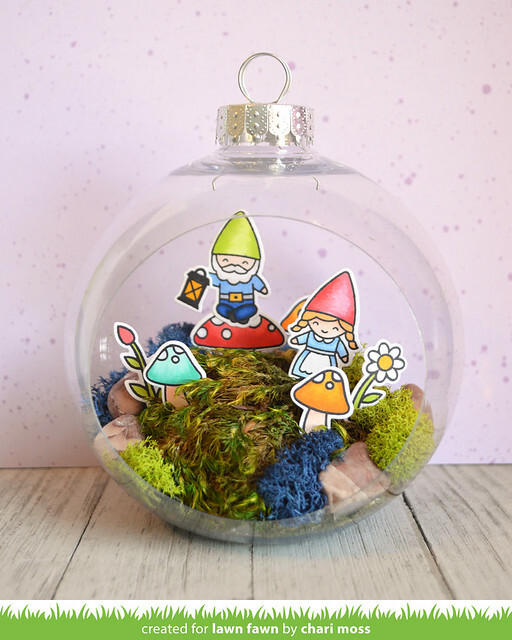 I also created this cute little terrarium using the set. I bought these plastic ornaments at Michaels at Christmas time. The front is already cut out waiting for it to be filled with a scene of some kind. The base is created with a styrofoam ball cut in half and then I just added moss and rocks overtop of the base. All the pieces are glued to toothpicks with hot glue which are easily inserted into the styrofoam below. 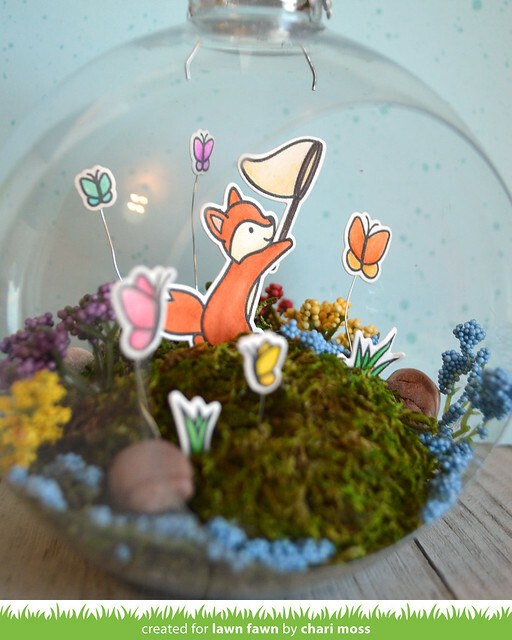 I just think this little terrarium is so cute. I have it sitting in my craft room and hope to suspend it from the ceiling eventually. 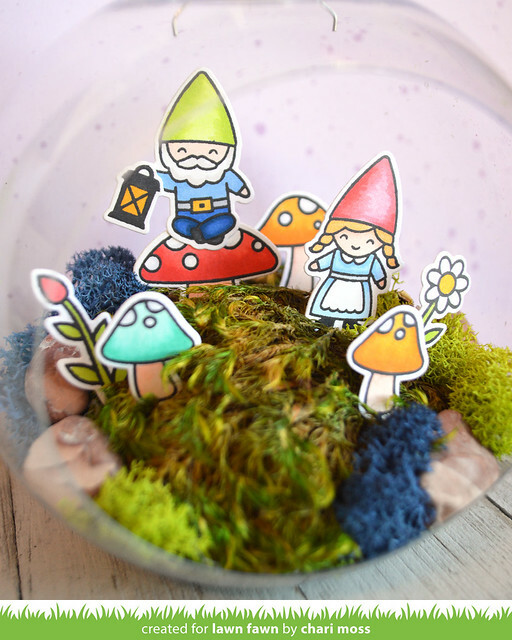 Be sure to check out the Lawn Fawn blog for more Oh Gnome! projects.